What would we do without coffee on these cold, dark January mornings? Aside from tap water, coffee is America’s most-consumed beverage, fueling 1.7 million national jobs. But as climate change drives heat waves, droughts, and pest outbreaks across the globe, our favorite brews are at risk. About half the world’s coffee-producing land will be unsuitable by 2050, according to a report from the International Center for Tropical Agriculture (CIAT). Warming will especially damage the higher-quality Arabica bean, which grows best between 64°F and 70°F. Arabica accounts for about two thirds of global coffee production but is limited to subtropical highlands in Brazil, Central America, and East Africa. The low-grade Robusta bean is more heat-resistant, though less tolerant of major swings in temperature and precipitation. 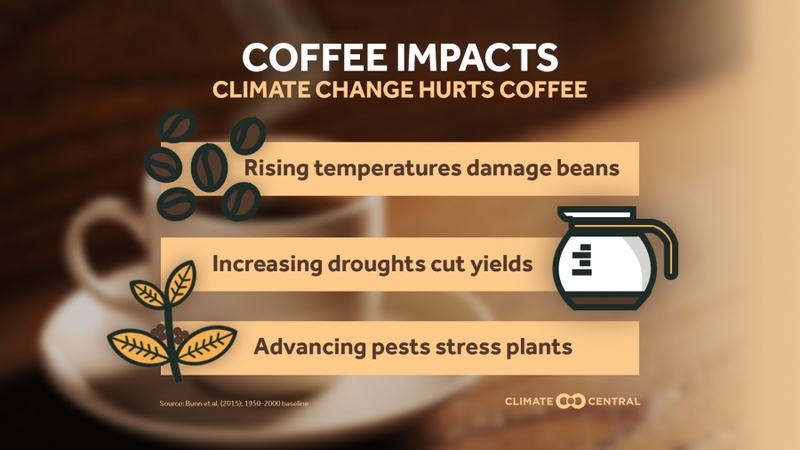 And both species suffer from pests like the coffee berry borer, which causes over $500 million in annual damages and is spreading in a warming world. Extremes in 2014 point to a concerning future. Drought hit Brazil and Vietnam — the world’s top two coffee producers — slashing yields. One Brazilian region saw just 10 percent of its typical wet season rainfall. Meanwhile, high heat and heavy rainfall intensified an outbreak of leaf rust fungus in Central America, leading to $250 million in production losses. The result: a near-doubling of Arabica bean prices in just one year. Cutting our greenhouse gas emissions could reduce these consequences. 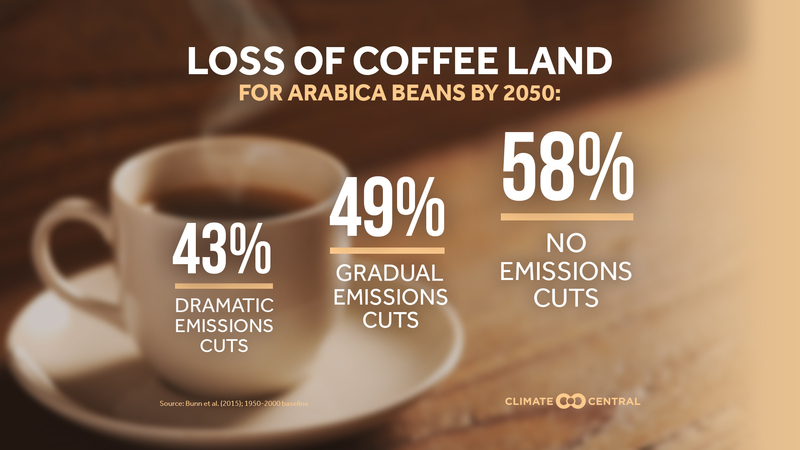 According to the CIAT report, immediate action (represented by the RCP 2.6 scenario) will lead to just 43 percent of Arabica land loss by 2050, compared to 58 percent with unchecked emissions (RCP 8.5). For Robusta, land loss could range from 51 percent to 64 percent. Solutions must also come from the coffee industry itself — and its consumers. CIAT and World Coffee Research are working to limit land loss with shading strategies, more resilient bean varieties, and more natural biological control of pests. Companies like Starbucks have founded the Sustainable Coffee Challenge, which now includes over 100 partners that are committed to smarter production. And as global demand for coffee could double by 2050, consumers can play a larger role. By choosing sustainable coffee varieties, we can help coffee supplies persevere in a harsher future. Methodology: Projections for suitability of coffee-producing lands are taken from Bunn et al. (2015); Table 3 in the Supporting Information has regional values for both species. The calculations use a baseline of 1950-2000 and include land that will be newly suitable as well as no longer suitable.